Here's an audio recording of Hilary Putnam and Alvin Plantinga, two of the greatest living philosophers, discussing the existence of God. I didn't realize that Putnam is Jewish. It's from ten years ago, but it was just put on YouTube a couple of days ago. Seriantia que quondam fuit Rollandi le Pettour in Hemingeston in comitatu Suff ’, pro qua debuit facere die natali Domini singulis annis coram domino rege unum saltum et siffletum et unum bumbulum, que alienata fuit per particulas subscriptas. How then does the humble fart illuminate identity and social relation? 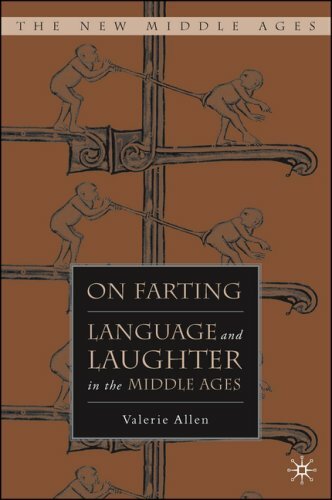 If Roland’s caper seems only to vindicate the common myth that medievals farted without regulation, we should keep in mind that the singularity of his tenure attests to an awareness of the unseemliness of farting in public, not to mention in front of your sovereign. Medieval farts bear the same burden of anxiety, low humor, and indifferent necessity that they do today, yet they also open up the gap of cultural consciousness that yawns across seven centuries and more. He in a foolish manner (not without laughter) began to use a thousand jestures, turning his eyes this way, then that way, seeming alwayes as though he would have presently begun to speake: and at last, fetching a deepe sigh, with a grunt like hogge, he let a beastly loude fart, and tould them that the occasion of this calling of them together was to no other ende, but that so noble a fart might be honoured with so worthy a company as there was.